75 evangelical scholars offer a thoroughly researched guide to Christianity, other world religions, and alternative religious views, including entries on movements, theological terms, and major historical figures. Perfect for anyone who wants reliable information on today's diverse religious landscape! 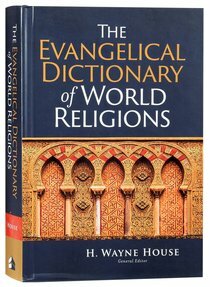 About "The Evangelical Dictionary of World Religions"
:With all of the different religions, sects, denominations, and belief systems out there, it can be difficult to separate the facts from mere opinion, especially if one is relying solely on online sources which may or may not be vetted and which often have an ideological or political slant to them. How can we truly understand if we cannot even be sure we are getting the facts straight? In this comprehensive resource, more than 75 evangelical scholars offer a thoroughly researched guide to Christianity, other world religions, and alternative religious views, including entries on movements, theological terms, and major historical figures. Perfect for pastors, students, and anyone who wants ready access to information on today's religious landscape.